While finding some respite from intense op-tempo and some minor physical maladies, I’m easing back into blogging. To start out I thought that some obvious insight is useful in outlining information and how it applies to all kinds of systems. 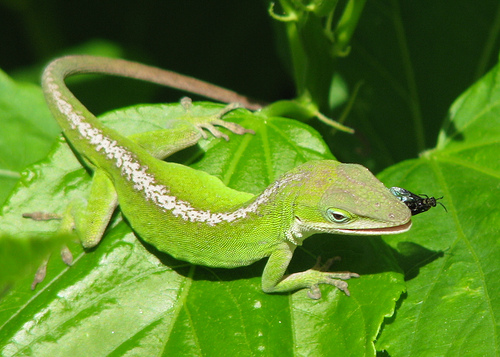 The photo below is an example of Anolis carolinensis, also known as the green anole. It is very common and competes with the introduced Anolis sagrei here in the American southeast. (Photo thanks to GeorgiaInfo). It is a complex adaptive biological system. The genome of this amniote has been sequenced. It consists of 1.78Gb, that is, Giga base pairs. Information is everywhere and in everything. Deriving its significance–tempered by wisdom and humanity–will lead us to the core, essential truth of our universe; including how to live our lives within it.